Since precisely one year hockeydata is on the road with Austrias morning show „Guten Morgen Österreich“ by the Austrian Broadcasting Corporation “ORF”. Every week another federal state, another region and another town. But what always stays the same is the excitement of the local visitors and the spectators at home in front of the TV! hockeydata co-operates as graphic service since the very first beginning of the show and overall six employees of our team are involved in this year-round ongoing project. After 244 shows the anniversary took place in the town Feldkirchen (Carinthia) today. 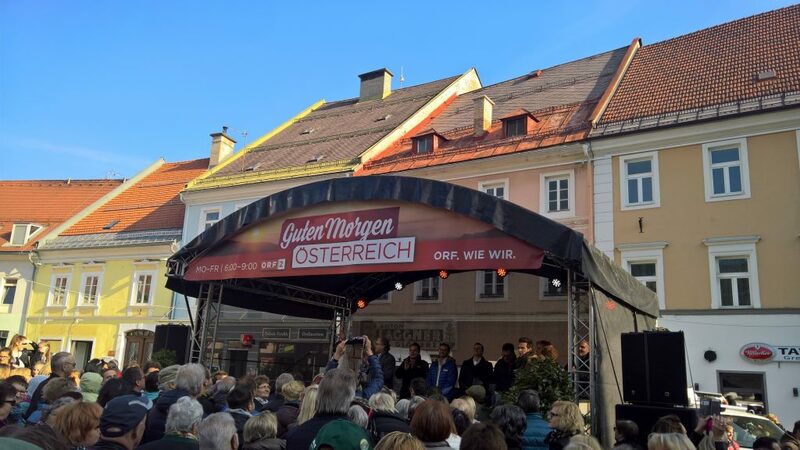 More than 2.000 delighted visitors and spectators showed up at the scene und celebrated together with several special guests (such as the governor of Carinthia Peter Kaiser and the general secretary of the “ORF” Alexander Wrabetz ) the shows birthday!